Sparring directly with the best from Audi, Lexus, Jaguar, Mazda, BMW….. No, hang on, the list just continues to grow – such is the massive number of new SUVs that Aussies can buy. Did you know that just earlier this year more Australian people were buying more SUVs than wagons, hatchbacks, people-movers and sports cars put together. One of the standout cars sales segments is in the medium-sized SUVs costing less than $60,000. Some of the big sellers in this field were the Hyundai Tucson and Toyota RAV4, while the Mazda CX-5 outsold both of those models. The Nissan X-Trail was also a strong seller. So how does the new Volvo XC60 stack up against this sort of competition? Very well – though the sales may not reflect it. It seems that people like to buy a car that has a reputation of build quality and value. As is the case with most vehicles these days, the electrical mechanisms found inside a new car are sourced from a few main companies that design and build necessary and particular components like safety airbags/equipment and satellite navigation. So in this respect, all major car manufacturers are in the same boat when it comes to obtaining this sort of stuff. Volvo is now China owned, and the new business venture is doing Volvo no harm at all. “Creating new manufacturing capacity is a key step in Volvo’s global growth plan”, says Kerssemaker – Senior Vice President of Volvo Cars North America. Volvo wants to sell 800,000 vehicles a year worldwide by 2020, up from 503,127 last year. The new Chinese plants were the first step, but having a manufacturing plant in America and not Mexico (where BMW, Audi and Mercedes have their manufacturing plants) has a tone of strength and a long-lasting nature about the deal. Volvo cars and SUVs are making unprecedented sales globally. The new Volvo XC60 SUV is a blend of modern art and technological clarity. Everything about the Volvo XC60 is beautifully designed and crafted. Chinese made Volvo’s have proven reliable and solid, and the new XC60 is extremely well put together. 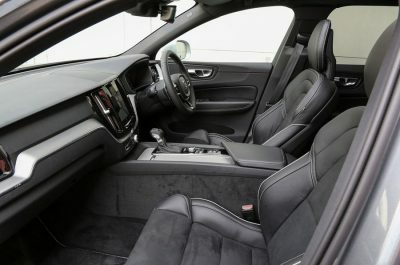 Buyers of new Volvo vehicles enjoy the clearness and straightforwardness of the interior design, which is then coated in impeccable luxury materials, enabling it to match and better the best from Germany and Japan. Volvo has also got the blend of sport excitement and luxury near perfect. Most luxury SUV buyers know that there is a lot more to a satisfying drive than going 250 km/h down the German autobahn! 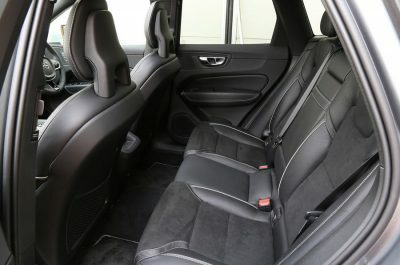 Inside the 2017 Volvo XC60 is a Swedish inspired cabin with premium leather and style. Comfort is first-class and each new XC60 is loaded with exceptional infotainment and luxury features. The leather seats have been hand stitched, while trimmings of chrome and wood detailing are stunning. 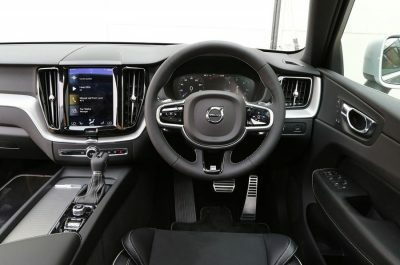 Volvo includes features like the brand new Sensus infotainment system that is easy-to-use and its operation and function are based around a tablet set-up of touchscreen menus. You can connect a smartphone to the Sensus system and work through your Smartphone messages and phone calls. Sensus will also run through your own music lists that are loaded onto your smartphone. Satellite navigation is standard on all models, so you have no excuse for not finding your way from A-to-B. A premium audio system has concert clarity, sounding exceptionally classy. Space and seating comfort is good for the class, with luggage space being a little over 500 litres with the rear seats up and in place. This is not huge, but still remains useful. Volvo safety systems in the new XC60 are totally modern and up-to-date, with the best accident avoidance, airbag and active dynamic braking systems a standard feature for each model. Volvo’s ‘Pilot Assist’ semi-autonomous auto-steering radar cruise control is perfect for the open road. This is one of the safest SUVs on the market, as you may well expect. Volvo XC60 engines are powerful and refined, the T5 being an inline four-cylinder turbocharged petrol engine with a 2.0-litre capacity. There’s plenty of low- and mid-range torque to go on and so the T5 makes fairly brisk progress and refined cruising. The T6 is a step up from the T5 in performance, with the engine boasting supercharging as well as turbocharging. The torque and power of the T6 is excellent. Flagship material, and very modern, is the Volvo T8 engine with hybrid, turbocharging and supercharging technology all in the one package. Again it is 2.0-litres in capacity but very powerful with 300 kW of maximum power and 640 Nm of torque! The new Volvo XC60 T8 can move its SUV formula with ease. D4 and D5 diesels are available for those who love wonderfully lusty diesel torque through the low-to-mid range. These are really efficient engines and are set-up perfectly for the buyers who need to tow. The D4 has 141 kW, while the D5 has around 173 kW. 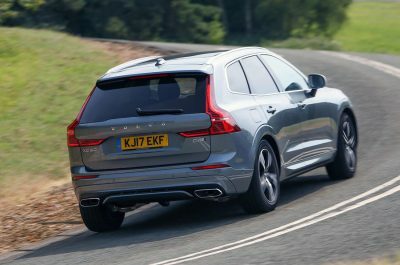 Having AWD traction will make the new XC60 really popular with the ski bunny, and off-road the Volvo XC60 performs very well indeed. The car has the ability to make an adventure a reality. The Volvo XC60 is a great addition to the speedily expanding brand. It may not be as cheap as a Mazda CX-5, Hyunda Tucson or Toyota Rav4 but then it isn’t. But if you buy one, then you’ll appreciate the difference. The current 2017 Volvo XC60 models are yet to be announced, so we’ll keep you posted. Better still, contact the team at Private fleet Australia. For any more information on the new Volvo XC60 or, for that matter, any other new car, contact one of our friendly consultants on 1300 303 181. If you’d like some fleet discount pricing (yes even for private buyers! 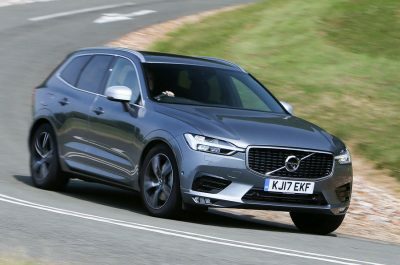 ), we can submit vehicle quote requests out to our national network of Volvo dealers and come back with pricing within 24 hours. Private Fleet – car buying made easy!